Ivan Lambrov establishes IBIS Art Glass Studio in 1992. The studio is located in Plovdiv, Bulgaria. It is a modern studio equipped for the design and manufacture mostly of architectural art glass. The experience of working with architects, corporate and private clients results in creating architectural art glass of high quality. Large scale commissions for the interior market are fulfilled. Ivan Lambrov oversees all projects. He is a highly skilled and widely acclaimed artist who is responsible for the design. Ivan Lambrov creates studio art glass also. His works are cast glass sculptures and fused glass pictures. The artist exhibits them in galleries in Bulgaria, Europe and the United States. He has had 12 one-man glass exhibitions. Ivan Lambrov is born in 1963, in Bulgaria. He is a graduate of the National Academy of Fine Arts in Sofia, Bulgaria with an M.A. degree in Mural Painting. 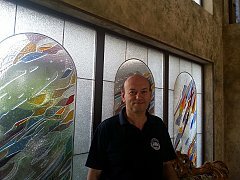 His artworks are paintings, mosaics, frescoes, and glass. He has had 17 one-man painting exhibitions. He makes oil paintings, acrylic paintings and watercolours. Ivan Lambrov is a member of the Union of the Bulgarian Artists.